The Kiddiewinkles 2 in 1 Enchanted Garden and Fairy Woodland Playhouse is sure to put a smile on any little girl’s face who is lucky enough to get it. Available in two sizes, one for smaller and one for larger kids, this girl’s playhouse has been designed to look like it is a magical woodland cottage set in a mystical enchanted garden. 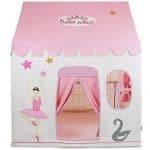 It has a door with a cover and a set of windows that actually have adorable fabric curtains so they can have a little privacy when they are having fun with their friends or toys. It has a very lightweight design so it can be played with inside when the weather is bad and then easily carried outside when the sun is out. While this is a fabric playhouse, it is actually very well made and a lot stronger than its cute design suggests. It is made with 100 percent cotton that will not rip or damage easily. The frame is made from metal so the whole structure has a good feel to it and will not see any of the parts of the frame snap easily. The materials make it very low maintenance and something that will look just as good inside as it does outside. Here we have the Kiddiewinkles 2 in 1 Enchanted Garden and Fairy Woodland Playhouse which is one of the most adorable fabric based girls playhouses we have seen. 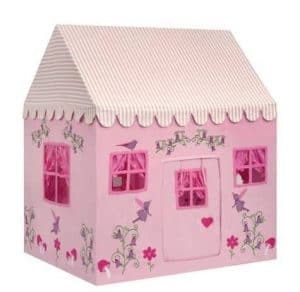 It has a great design to it with its lovely pink colouring and the top of the playhouse resembling the fairy woodland house and the bottom of it being the enchanted garden with floral designs and birds printed on it. 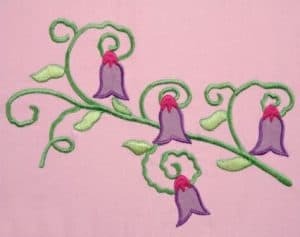 It really does look pretty cool and we are sure that any little girl who looks at this is going to just fall in love with it and feel like they are a real Disney Princess with their own little house. It is 3 feet 7 inches in its length and 2 feet 4 inches in its depth so it is one of the smaller playhouses on the market, but its size works to its benefit as it means you can have this inside when the weather is bad. It stands a bit under 4 feet high along the ridge so taller children may not be able to stand up inside of here, but for sitting down it is going to be fine. We really like the design of the roof. It is an apex style roof that has pink and white stripes on it. While it is made of fabric it is still very strong. Still, you will not want to leave this out in the rain too long. While we like the pink and white stripes, we do feel they could have put a couple of birds or other animals on here to help with its enchanted garden and fairy woodland theme as it does look plain compared to how active the rest of the playhouse is. 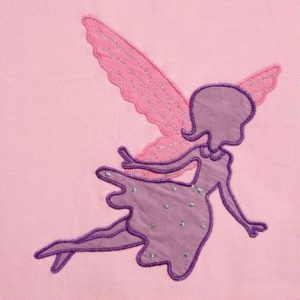 The Kiddiewinkles 2 in 1 Enchanted Garden and Fairy Woodland Playhouse is made with some very high quality fabric so you do not have to worry about the kids ripping it easily. It will be able to take a bit of abuse from the kids and still look good. As we said before it has some lovely designs on it that really do help to bring it to life. Many girls playhouses that are more designed for indoor play will have a cheap, easy to snap plastic frame. This is not the case here. This playhouse comes with a strong, but lightweight metal frame. This was a very nice surprise as it will ensure that this playhouse is far stronger than cheaper fabric playhouses. Also the frame is light enough that you will easily be able to put the playhouse outside and bring it back in again without needing the strength of The Incredible Hulk to do so. Playhouses like this do not tend to come with a floor and that is not something we are too bothered about. Having a fabric floor might look good the first couple of times the kids play with the playhouse, but it will not take too long for it to get grubby and dirty so we think it is good they have not put a floor in here. Getting a fabric playhouse like the Kiddiewinkles 2 in 1 Enchanted Garden and Fairy Woodland Playhouse makes things a bit easier on you. What me mean is that once it is built, you do not have to worry about treating it like you do a wooden playhouse. Just be sure not to leave it out in the rain and it will be fine. They are not actually very forthcoming with what kind of warranty you get with this playhouse, but we would be very surprised if it was a 5 or 10 year warranty like you get with most wooden playhouses. The majority of fabric playhouses we have seen come with a one year manufacturers guarantee, but still be sure to ask about the warranty before you order. The door is one of the more charming features of this playhouse. They have used a strong piece of fabric that when down will cover the whole door. We really like this as some fabric playhouses tend to just have a little strip that does not cover the door. It has a lovely little heart pattern on it and a snazzy little window for them to look through as well. The Kiddiewinkles 2 in 1 Enchanted Garden and Fairy Woodland Playhouse has lots of windows. We were actually surprised at just how many windows there were. Each side of the playhouse has these cute windows that are made with a fabric frame to give them that little bit extra style. What we really love about these windows though is how they have these lovely little curtains. We have not seen many fabric playhouses that have this kind of attention to detail so it was great to see. Of course as this is made with fabric, you are not exactly getting a whole lot of security here. Just be sure not to leave it in your garden overnight and it will be fine. 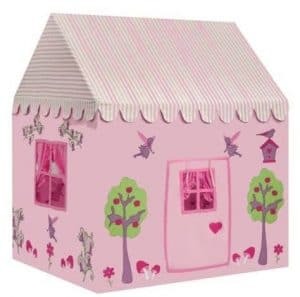 We would go as far to say that this is one of the if not the most private fabric girls playhouse we have seen. The fact that the door can be completely covered as well as the little curtains make this a place the kids can go to hide when mum and dad are nagging them. As this is a fabric playhouse, you do not have any customisation options to pick from. It is what it is, but that is not a bad thing as it does have a great design. Maybe you could put a couple of patches on the roof, but to be honest with you it is not something that is necessary. While not an extra, the Kiddiewinkles 2 in 1 Enchanted Garden and Fairy Woodland Playhouse can actually be purchased in two sizes. The review you have just read was for what they call standard small model. But for £214.99, you can purchase the large model which is the same style, but it is 4 feet 4 inches long and 3 feet 6 inches deep. It is also taller at 5 feet 4 inches. If you have bigger kids then getting the larger model is certainly worth considering. You cannot compare a fabric playhouse to a wooden one. But this is one of the best made fabric playhouses we have seen and we are very impressed with the metal frame they have used. If you get the larger model then this will last your children a long time. The small one though, we feel may be outgrown rather quickly. The materials in general though are good and more robust than you would think. Of course this does depend on the model you get. The smaller one is good for very young children. But we feel the larger model would work better as they will get more years out of it. Fabric playhouses are very easy to install. You just put the frame together, attach the fabric and that is it. This is just a one person job and will not take you much time at all. 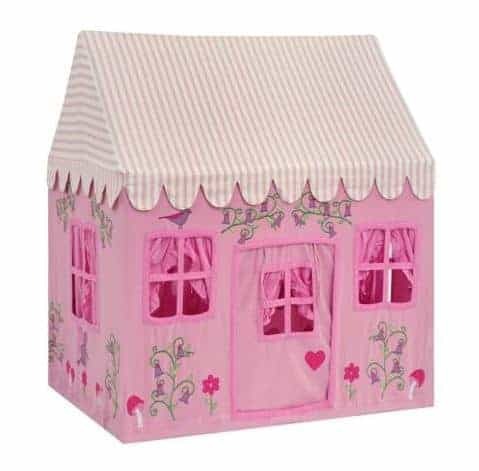 The price of both models of this girls’ playhouse we feel is very fair and actually a little cheaper than some of the other fabric playhouses we have seen. Final Thoughts: We do not get to see a whole lot of fabric girls playhouses here at WhatShed. So when we do and it is as cute and well designed as the Kiddiewinkles 2 in 1 Enchanted Garden and Fairy Woodland Playhouse is, it is something we get excited about. They have done a very good job with this. We cannot imagine any little girl not loving its cute design. The metal frame is great and the cotton they have used will be strong so it is a well made playhouse. Still we do know that some may think it is a little high priced for a fabric playhouse. But keep in mind this is not like those cheap fabric playhouse that pop up. This would be an ideal buy if you want something they can enjoy in the house and out in the garden.